POLYTECHNICS have been given greater flexibility to accept more students with a passion for teaching young children, amid efforts to retain pre-school teachers. From this year, Temasek Polytechnic and Ngee Ann Polytechnic can admit up to half of their intakes for early childhood courses using criteria other than exam results. This is up from a cap of 30 per cent for other courses. The change applies to three full-time diploma courses: Ngee Ann Polytechnic's child psychology and early education, and early childhood education, and Temasek Polytechnic's early childhood studies. 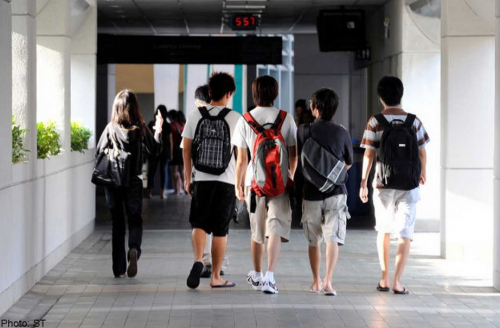 Under the discretionary admissions exercise, students are chosen based on their abilities and interest in the course, rather than just their O-level results. So in some cases, they can secure places in polytechnic courses even before receiving their results, or even if their results do not meet the cut-off points for these courses. But selected applicants will still have to meet minimum course requirements and score no more than 26 points for English and four other subjects - a requirement to enter a polytechnic. If more high-performing students apply for a certain course, its cut-off point is likely to be lower, indicating better performance. Besides submitting a written application each, they have to go for interviews and are evaluated based on things such as co-curricular records and testimonials from teachers. Mr Ang Teck Hua, director of the Centre for Child Study at Temasek Polytechnic, said that experiences such as helping out at pre-schools and orphanages, or organising children's camps as part of community service will be taken into account. More than 2,000 students were offered a place at the polytechnics through the discretionary admissions exercise last year. It runs until April, when the polytechnic term starts. A Ministry of Education spokesman said that the change allows the polytechnics to "better select those who are keen to join the early childhood sector, by assessing candidates based on strengths and aptitudes specific to the sector". She added that it is in line with the Early Childhood Development Agency's efforts to "attract and retain passionate early childhood professionals for the sector". In recent years, the Government has been trying to attract and retain pre-school teachers with incentives such as better pay and training. Singapore has 14,000 pre-school educators, and hopes to hire about 1,500 more by 2017. So far this year, 43 students have used discretionary means to secure places in Temasek Polytechnic's early childhood studies course, which has space for a cohort of 125. Mr Ang said: "A teacher's heart is what makes a good preschool teacher and that, to me, is more important than having distinctions." Some students who come in via the discretionary route in previous batches also did better than their peers when they graduated, he said. Glynis Koo, 17, who clinched a spot through discretionary admissions to pursue early childhood studies at Temasek Polytechnic, said: "It has been my dream for some time to be a preschool teacher. To see the children progress in little tasks, such as learning to talk, is very rewarding."